The famous No. 3 will make a return to the NASCAR sprint Cup Series in 2013. This week saw the announcement that a lot of people have been hoping to hear for a number of years. To be fair to the other side, it was also an announcement that some hoped would never come. Car owner Richard Childress announced the return of the No. 3 to the NASCAR Sprint Cup series with his grandson Austin Dillon behind the wheel. In my opinion, race fans should be excited about this. See in our world, unlike other professional sports, we don’t retire car numbers because of a tragedy or because of someones career-long success using a particular number. It’s just the way our sport does business and in no way shape or form is it disrespecting any driver. It’s the same in this case following Richard Childress’s announcement. It doesn’t disrespect Dale Earnhardt Sr.’s memory or legacy. Honestly, I view this as the final step in the overall healing process that our sport has been going through for almost 13 years. Remember, we’ve seen the return of the No. 3 in the Camping World Truck series and the Nationwide Series by Richard Childress. Both his grandsons, Austin and Ty Dillon, have used it in those series. So now this is the next step in the progression. I say it’s time to begin that final chapter and move on. The reality is that number did not define Dale Earnhardt. Dale Earnhardt defined Dale Earnhardt. He was the people’s champion. He won races. He is one of only two drivers in our entire sport to win seven championships. He was a racers racer. I don’t think any part of that says anything about a number. That number simply happened to be the one on his door. When you see that number on the track and it stirs memories of Dale for you, well that’s awesome. Personally when I see it, it brings back memories of Dale and everyone before him who raced and did great things with the No. 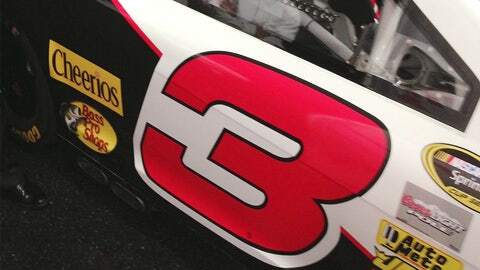 3 including his car owner Richard Childress and even Junior Johnson when he used that number. It’s a representation and reflection of all those who have used the No 3. Starting now it’s a new chapter in the famous history of the No. 3. I love the fact that it’s Richard’s grandson who is going to be writing that chapter. I simply love the idea of keeping it in the family and knowing Dale as well as I did, I promise you he would feel the same. I think the biggest challenge we as fans are going to have to realize and accept is we can’t be going way off the reservation in criticism when the No. 3 isn’t sitting on poles, winning races and contending for championships immediately. It’s simply not fair to put that kind of pressure on a rookie. Dale was his own man and carved out his own place in history. We as fans have to be willing to accept and give Austin the chance to be his own person, make his own mistakes and succeed on his own. That’s my biggest concern that Austin can hold up under the pressure that a certain segment of race fans are going to put on him by expecting him to walk on water simply because of his car number. Don’t for a minute think there aren’t critics already lined up in the wings ready to pounce. There’s a certain portion of race fans who believe this is a complete disservice to Dale’s memory. I believe them to be wrong, however, everyone is entitled to their own opinion. I’m just saying give the boy a chance. Let him sink or swim on his own ability, not based on those who succeeded in the No. 3 before him. It’s time to move forward. I think now is the perfect time, with the perfect scenario and ultimately it will be great for the sport.